Researchers at the University of Illinois at Urbana-Champaign have created an innovative robot which has a more dramatic range of motion and a more accurate control of its movements. Researchers hope that this "bio-bot" can enhance future designs of robots for research, construction, exploration, and even disaster relief operations. This bio bot is powered by a skeletal muscle tissue from a mouse. It is skeletal tissues that drive human movement – from a little twitch of the finger to the whole leg running. Inspired by the starfish with its stretchy yet strong structure, the bio-bot is a 3D printed soft robot with integrated mouse skeletal muscle tissue. The results were amazing. The soft robot was able to carry out a more dynamic motion that, when compared to its predecessors, is freer and more capable of complicated motor tasks. This soft robot was able to move with the help of electric currents, making it more manageable than its soft robot predecessors made of cardiac muscles. Bio bots made with cardiac muscle tissues are difficult to control because the cardiac tissues twitch uncontrollably. 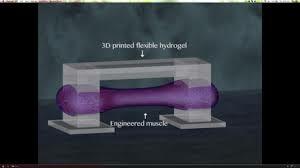 But, with the use of skeletal muscles, the researchers have complete control over the bio bot just by manipulating the electrical current. Speed of the bio bot can easily be influenced by slowing down the frequency of the electrical signals. If an increase in speed is needed, a corresponding increase in frequency of the electrical signal is used. With this great finding, it opens hundreds of different possibilities for forward design principles. It also opens avenues for engineers to customize this study to fit specific applications like mobile environmental analyzers, “smart” implants, surgical robotics to name a few. With the successful completion of the study and the research, the researchers announced that the cell-based soft robots can further the designs of systems and machines that can animatedly respond and sense a range of multifaceted environmental signals.